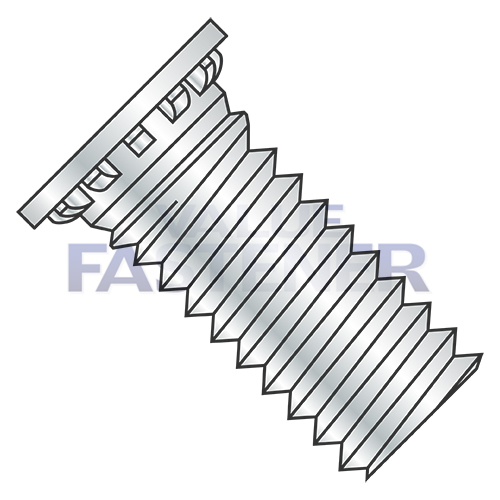 Self-Clinching Studs are a fastener with unified thread pitch and a cylindrical, low profile head with small, rectangular ribs protruding from the underside of the head. The top of the head is flat and is flush with the mating surface when installation is complete. Below the ribs and above the first thread is an annular groove which helps to hold the fastener in position. Self-Clinching Studs are intended for metal panel-to-panel applications and well-suited for use in printed circuit boards. A hole is pierced into the circuit board and the unit it is attached to. The stud is inserted using a hand press or by hand, applying parallel squeezing forces. A hex nut is twisted onto the stud, securing it from the back. As the nut is tightened, the ribbed stud head grips the front panel to secure the application from the front as well, eliminating the need for welding. As the application force is applied, part of the sheet cold flows into an undercut under the head, making the fastener an integral part of the sheet.